My first stunt kite (what you see in some of the video above is a Prism E2 – here’s the Prism E3, the next generation in that line). It’s a great “intermediate” kite that I was able to pick up in just a couple sessions. I had no other stunt kite experience at the time. I learned on my own and crashing now and then, but I also got technique help from this video that came free when I purchased the kite at a local store. It shows some awesome advanced tricks, but gives great basic technique, too. There is also a ton of good stuff on youtube, of course. Even if your left/right lines seem to be the same length, there are still probably small variations (and there will be more as you snap and retie lines). Keeping your kite steady and unmovving may actually mean one hand is pulled in more than the other. You’ll have to experiment to find this sweet spot. Learn a good knot for rejoining a broken kite string. Versus a standard square knot, it will look better, be far stronger, and will lessen the changes of breakage. If it doesn’t get off the ground, you don’t have enough wind, or your kite is assembled wrong. If it launches but then soon turns and nosedives, then your steering is off – pull the string of the side you want the kite to turn to (if it turns right, pull on the left string until it evens out). If the kite pinwheels a bunch of times, then either something is wrong with the kite (check your build, or a line may be tangled on the kite), or you’re pulling too much on one string. When you launch, make sure your strings are NOT twisted – each string should head right to the kite without crossing over the other. You can still launch all twisted up, but given the above tip, twisted strings make steering trickier. Keeping the kite straight does not need big movements. It’s like when steering a car down a straightaway: Use small, corrective motions. Resort to big moves and moving back/forward when you’re doing tricks or recovering if you lost wind. Expect to break a few carbon fiber struts and things. Luckily, the kite is designed so that repair parts are modular and cheap. Give yourself more room than you think you need. Expect that the kite will crash anywhere within your flying radius. If you have 100 feet of string, anything in that 100 radius the leeward side of the flyer is a target. 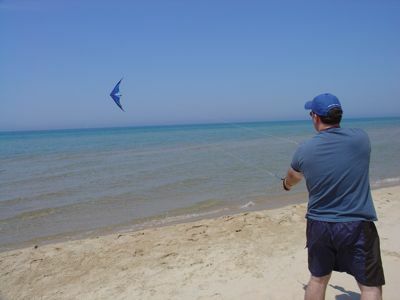 Keep kids and pets FAR AWAY from the kite path – that carbon fiber arrow can fly up to 70 MPH. It’s a fun hobby, but don’t screw around with safety. Wind speed is critical. It’s obvious, but do pay attention to it – how fast it is, and (most important), how stable. My kite was only good within a certain wind speed range. Not enough wind (or if it was just intermittant gusts), and I’d lose momentum and stall out. Too much and the kite would move extremely fast, be difficult to control, and was potentially dangerous (your lines may break). The best experience I had was taking it to a beach when the wind was constant. Stunt kite flying: It looks cool and can engage anyone with basic coordination and the knowledge of right and left. The best part: It’s a lot of fun.